The coronary arteries provide blood to your heart muscle. The monounsaturated fats in olive oil help to keep those arteries clear so your heart can get enough oxygen and nutrients to keep pumping. But it's important to know that many of the studies that examine the effects of olive oil are designed to look at the Mediterranean diet in general, which makes it difficult know for sure how much of the health benefits are due specifically to olive oil. Some health benefit may come from the whole grains, nuts, seeds, vegetables, fruits or fish. However, one study published in 2011 in Nutrition, Metabolism and Cardiovascular Diseases concluded that olive oil lowered cholesterol, apparently due to compounds other than the monounsaturated fats. Olive oil is rich in polyphenols that work as antioxidants to protect the cells in your body, and some have other beneficial effects -- perhaps lowering cholesterol is one of them. It's also possible that those polyphenols may help prevent some forms of cancer -- another study published in 2011 in Lipids and Health and Disease found that people who consumed more olive oil had lower rates of cancer. However, that's observational data, and there could be other reasons why people who ate more olive oil were less likely to have cancer. Use olive oil dressing on your favorite salad. Dip pieces of 100-percent whole grain bread in a dish of olive oil that has been dusted with pepper and oregano. Sprinkle green vegetables with olive oil instead of margarine or butter. Make pesto and serve with your favorite pasta. Prepare your own cranberry vinaigrette for salads. Add flavor to olive oil by infusing the oil with sprigs of rosemary or other dried herbs. Store olive oil in a dark, cool spot in a tightly covered container. You can keep olive oil in the refrigerator; however, it will get thick and cloudy. That's okay -- the olive oil will return to normal when it stands at room temperature. 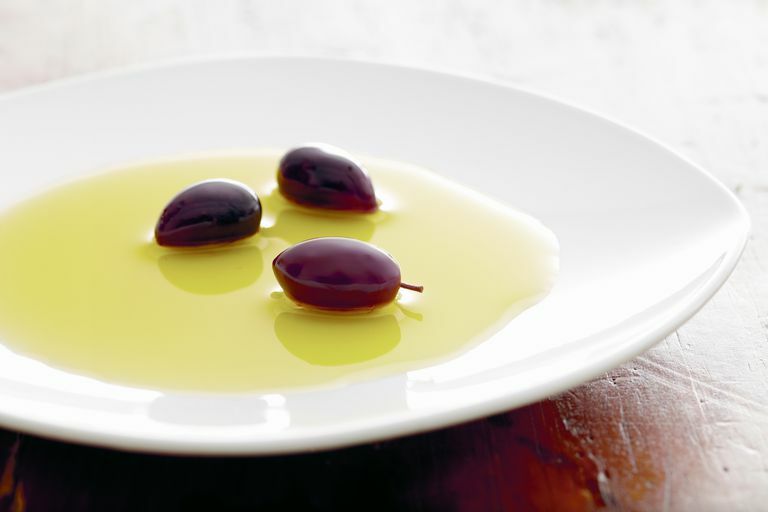 Keep in mind that while olive oil is rich in monounsaturated fats, it's still high in calories. Watch your serving size -- one serving is two tablespoons, and that's all you need per day. Covas MI, Nyyssonen K, Poulsen HE, Kaikkonen J, Zunft HJ, Kiesewetter H, Gaddi A, de la Torre R, Mursu J, Baumler H, Nascetti S, Salonen JT, Fito M, Virtanen J, Marrugat J, EUROLIVE Study Group. "The effect of polyphenols in olive oil on heart disease risk factors: a randomized trial." Ann Intern Med. 2006 Sep 5;145(5):333-41. http://annals.org/article.aspx?articleid=727945. Damasceno NR1, Pérez-Heras A, Serra M, Cofán M, Sala-Vila A, Salas-Salvadó J, Ros E. "Crossover study of diets enriched with virgin olive oil, walnuts or almonds. Effects on lipids and other cardiovascular risk markers." Nutr Metab Cardiovasc Dis. 2011 Jun;21 Suppl 1:S14-20. doi: 10.1016/j.numecd.2010.12.006. http://www.nmcd-journal.com/article/S0939-4753(10)00297-8/abstract. Psaltopoulou T1, Kosti RI, Haidopoulos D, Dimopoulos M, Panagiotakos DB. "Olive oil intake is inversely related to cancer prevalence: a systematic review and a meta-analysis of 13,800 patients and 23,340 controls in 19 observational studies." Lipids Health Dis. 2011 Jul 30;10:127. doi: 10.1186/1476-511X-10-127. http://www.ncbi.nlm.nih.gov/pmc/articles/PMC3199852/.